For the longest time I was a huge complainer about Swagbucks with not understanding how to make more Swagbucks and getting frustrated easily with the website. I have been able to get gift cards from the site though in the past but I took a long break and chopped up my experience to "This site is to damn slow." Well after spending time researching reddit I came across a decent guide that helped me to start hitting my daily point goals on Swagbucks. So now Swagbucks is starting to grab my attention more. I will do this website everyday if I can keep hitting the goal. What I have done is actually bookmarked the Swagbucks search bar on my chrome since its my 2nd favorite browser. My PC has good speed so I can have more then one browser open with no issues. I do forget sometimes but I try to search in there for the chance of getting free Swagbucks while searching. I am checking the Gold surveys as well because some of them will give me 1 Swagbuck for being disqualified. Also though the 2 days that I did get surveys well this instantly made me meet my daily goal. So today so far I have got 78 Swagbucks. Now keep in mind none of these Swagbucks came from doing offers. This is from doing the daily poll, daily offer (NOSO), and watching videos. I know this won't be a thing for everyone but I also have a laptop and I have been using it to run the videos passively for I can keep working on my main PC. There is a Swagbucks TV app as well though that can be downloaded to view videos as well. The fun thing though is that with me putting Swagbucks back on my list this means I can hopefully stay motivated enough to earn from the winning streaks. The fun thing about the way they have the winning streaks set up is that you can choose to be super active or just to the 7 days. I am hoping to reach any of those this month if I can because that extra free Swagbucks would be pretty awesome. Oh before I forget this is my first time trying a team challenge I saw people mentioning it over at ForumCoin and since then I have wanted to try a team challenge to see how I did. This one is called Swag Bark and starts June 13th. Here is the cool thing stuff about it, it runs until the 17th. All you have to do is be active :) doing things like using the search bar, doing surveys, shopping and watching videos, oh and more you will be contributing to your team! If you can contribute at least 300 Swagbucks you will get a Swagbucks Swag Up Rebate. I think I got that right but hey if you signup checking the Swag Bark challenge page and read it for yourself. So if you liked this post please feel free to be kind and signup under me to help me out since I have no referrals yet :) And check out this awesome reddit guide to help you start earning Swagbucks quicker. 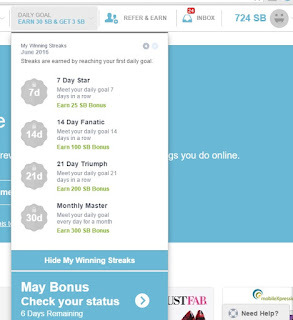 I have been doing swagbucks for about a month now, and have earned 7551 swagbucks so far. That is $75.00! I hit my daily goals each day, and just keep trucking. The key is to not get frustrated when the surveys say you don't qualify. 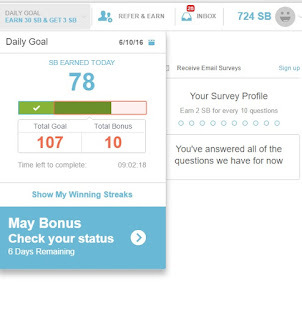 Some days I barely reach my daily goal, but others I can make over 600 swagbucks. That's a great day! I too, have joined the Swag Bark challenge and am looking forward to it! That is a good setup you have for multi tasking. I have been using my laptop to run Swagbuck videos and such while I use my main PC to do other work. I would like to do some more video sites though that are decent. Oh yes thank you. I don't play the games everyday but I should for the easy 10 and keep an eye on the swagcodes too! Updates And A New Job! My Earnings For May - Not So Good!